Don't let the lovely summer weather and long days stop you pursuing your favourite hobby of watching films. With a number of parks, roofs and open spaces across London now offering special outdoor movie screenings, you no longer have to watch films couped up inside grim multiplexes in the dark. We take a look at the best outdoor screening and open-air film events in London over the summer. The huge roof terrace of the Bussey Building in Peckham Rye is one of three venues for the Rooftop Film Club this summer with a series of films that gets under way on 3rd May with a screening of Lady Bird. The 5,000 square foot terrace boasts magnificent panoramic views of London, while guests can enjoy food from Rockadollar, a fully licensed bar serving cocktails and cold drinks while they enjoy a selection of classic films shown on a big screen with wireless headphones and comfy seats. The 2018 programme includes Black Panther, Beast, The Shape of Water and Darkest Hour as well as classics like Grease, The Wedding Singer and Blade Runner. On the 8th floor of a multi-storey car park in Stratford the Rooftop Film Club returns for another summer of new releases and cherished classics. The season kicks off on 3rd May with Dirty Dancing, Jumanji and Clueless, alongside recent releases Baby Driver, The Greatest Showman and Murder on the Orient Express. Not only do you get to see a film, there's also great food and cool refreshments on offer to enjoy with your favourite flick. All this in an unique alfresco setting where you can see the movies under the stars. One of four Rooftop Film Club locations in London, you can also find them at the Queen of Hoxton in Shoreditch, the Bussey Building in Peckham Rye, and The Roof Gardens in Kensington. Now a celebrated and integral part of Shoreditch summer nights, the Rooftop Film Club at the Queen of Hoxton rooftop terrace returns for its summer screening series, which sees a range of classic, cult and recent releases shown on a big screen on the roof for Â£15 a pop. This year the space has been transformed into a futuristic, utopia version of Las Vegas. The experience is far cry from the usual cinema multiplex fodder - with guests able to sit back under the glow of The City's skyline as they enjoy their favourite films with a drink in hand. Wireless headphones, a massive screen, comfy chairs, blankets, drinks and bar food makes for a great all-round experience - and the setting really is quite something. The Rooftop Film Club has also returned to the Bussey Building in Southwark and Roof East in Stratford. Described as "the kings of the outdoor cinema experience" (Tatler), The Luna Cinema continues its tradition of pairing movies with amazing locations with its summer 2018 season, which sees screenings take place at venues like Alexandra Palace, Brockwell Lido, Wimbledon Park, the Horniman Museum and Victoria Embankment Gardens. A showcase of cinema old and new, the line-up includes classics like Pretty Woman, Grease, The Goonies, Jaws and Ferris Bueller's Day Off as well as newer releases such as Dunkirk, Three Billboards Outside Ebbing Missouri, Get Out and The Greatest Showman. In partnership with Estrella Damm, a full bar service will be available at every screening to offer a taste of the Mediterranean. One of London's most popular outdoor screening events - and it's free. One of London's most popular outdoor screening events takes place at The Scoop, a 1,000-seat amphitheatre located between HMS Belfast and Tower Bridge in the shadow of City Hall on the south bank of the Thames. Every Tuesday from June to September there are current, classical and cult films on the big screen includingThe Greatest Showman, La La Land and Grease, which marks its 40th anniversary in 2018. The free, outdoor cinema screenings are part of London Bridge City's Summer by the River festival which this year takes on an English country garden theme. Also on the big screen are summer sports including Wimbledon, Ascot and the cricket as well asfree theatre, live comedy and music, fun family days, fitness classes and events to let your hair down on a Friday. Three Royal Opera House productions are broadcast live on a giant screen in Trafalgar Square in a magnificent free summer event in the heart of London. The BP Big Screen series kicks off with a new production of Swan Lake on 12th June, with choreography by Liam Scarlett. Up next is La boheme on 26th June, the first revival of Richard Jones's production of Puccini's passionate opera. The big screen season is completed by Mozart's tragicomic opera, Don Giovanni on 12th July, as Marc Minkowski conducts a world-class cast led by Mariusz Kwiecien. So, join friends and family, bring a picnic and get there early for pre-performance build-up 30 minutes before the show begins - all for free. Dubbed "London's best outdoor cinema" by the Evening Standard, Nomad Cinema takes place at an inspiring range of beautiful, curious and downright strange screening locations across London and beyond. The aim is for the film events to both embrace and enhance each venue, with a special festival atmosphere making the evening's both memorable and unique. This year's Nomad events take place at the Hoxton Hotel where Lost In Translation is screened, The Bride of Frankenstein is - spookily enough - at Brompton Cemetery while both Pan's Labyrinth and new release the Oscar-winning The Shape of Water are at Hyde Park Lido. There will also be a selection of food and drink at each screening and what's more 100% of profits go to The Sustainability Institute, a pioneering environmental and educational charity in South Africa. Nomad is presented by the popular Lexi Cinema in Kensal Rise and they're hosting a special special screening of The Adventures of Priscilla: Queen of the Desert on Thursday 30th August at their local Queen's Park in partnership with The Northern Territory of Australia where they'll be giving away a pair of flights to Australia on the night! Central London's only marina, St Katharine Docks, plays host to the Floating Film Festival this July, with recent releases and classic movies being shown on the big screen on the floating pontoon. Watch new films including Steven Spielberg's The Post, Dunkirk and Hugh Jackman's all-singing, all-dancing spectacle, The Greatest Showman, as well as modern classics like Back to the Future, Dirty Dancing and The Beach. Film showings start at 7pm and there are two family screenings on Saturday and Sunday at 2pm. Step on board the floating platform, pull up a deck chair or snuggle down in a bean bag and watch some all-time favourites complete with snacks, craft beers and cocktails. The masters of immersive cinema recreate Verona Beach at a secret outdoor London location. For the largest experience they've ever produced Secret Cinema puts star crossed lovers centre stage as Shakespeare's Romeo Juliet is made immersive. They're recreating Verona Beach at a secret outdoor London location in the spectacular, immersive way that only Secret Cinema can. Live bands, DJs, choirs and actors take on the legendary characters and feuding families, with the themes of peace, redemption and salvation explored. As many as 5,000 people a night will be transported to a world where the most memorable moments of Baz Luhrmann's 1996 film become reality and Shakespeare's story is told in a way you've never seen it before. Expect a summer of live music, shared song, mass dance and sunlit romance. 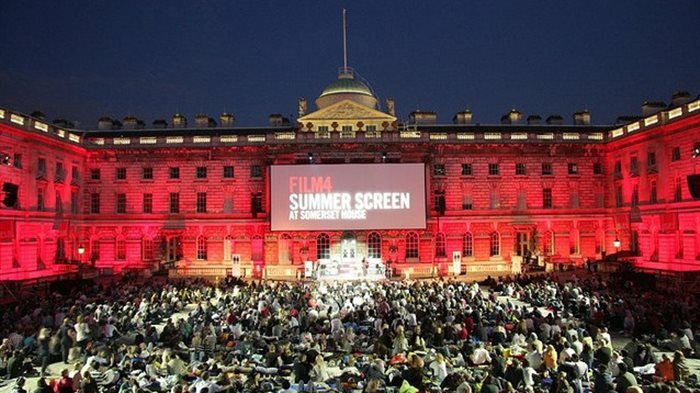 The most famous of all the open air film events in London, Summer Screenreturns to Somerset House in association with Film4 to bring cinema lovers a truly eclectic mix of movies. The 2018 line-up includes Inception, Labyrinth, Call Me By Your Name and Blue Velvet. New for this year, Somerset House has commissioned a short film by performance artists Mel Brimfield and filmmaker Ewan Jones Morris â%u20AC%u201C both resident artists in Somerset House Studios â%u20AC%u201C that will be screened ahead of each evening's feature film. There will also be DJ sets inspired by the evening's main event, al fresco picnics and a fabulous summer vibe. Between two long weekends of big British Summer Time gigs, Hyde Park hosts Open House, a week of free outdoor films, live music and entertainment. As well as Wimbledon Championship screenings from 12noon every day, two films will be shown each evening at 5.30pm and 8.30pm. There's live music from 6pm through to 10pm with Mister Kanish and Daytoner, a six piece band with a baritone, tenor sax, flute, keys, bass, drums and DJ. Freddie & The Freeloaders is followed by The London Gay Big Band, a twenty piece jazz orchestra, while on Thursday 12th July House Gospel Choir presents house-meets-gospel and the Old Dirty Brasstards perform their unique take on drum and brass. Try out the flying trapeze for free with Upswing, go retro at hip hop bingo and catch the Chickenshed Theatre for free daytime family entertainment. From cheap budget hotels to luxury 5 star suites see our discounts for hotels, including DoubleTree by Hilton London - West End from 58% off.